Bottle Rock is this week already! Here are some of our insider tips so you can have a fun and unique trip! -Let’s start with breakfast! My personal favorite is the english muffins from Model Bakery (in St. Helena and Oxbow in Napa). You can even get a breakfast sandwich made with one! Seriously insanely good. I’d also recommend the charming and recently re-opened Oakville Grocery. For a sit-down experience go to The Thomas or Solage for brunch! -Shopping is always on the to-do list and Napa Valley has some amazing finds. If you’re in the mood to splurge on some bling, go to Palladium or Patina! Owned by the adorable Marcus and Wayne, these jewelry stores are world class and right across the street from each other in St. Helena. Martin Design is always full of incredible interior inspiration. A new addition, off the beaten path is Steed! Flats has some of the best (you guessed it) flats around! I’ve been wearing their ballerina slippers for over 10 years. You can’t leave Napa Valley without buying some fabulous wine to take home. The divine 750 Wines has you covered! Head up to Calistoga to the Man’s Store for authentic workwear. Oxbow Market in Napa combines shopping with dining and drinking so make sure to check it out! -Now what else to do?? I love hiking the Oat Hill Mine Trail in Calistoga. Afterwards relax with a spa treatment from Indian Springs or Solage! Feel like wine tasting in a gorgeous setting? Frog’s Leap! Why not pick up the cult favorite fried chicken from Thomas Keller’s Addendum at Ad Hoc and sit in the sun for a picnic? Have a glass of Lorenza Rosé while you’re there. -Okay finally now… Dining! Napa is home to some of the best food EVER so have fun exploring and trying new things! I suggest a pizza face off between Ciccio and Redd Wood! Two great pizza spots and conveniently located across the street from each other! Gott’s Roadside (formerly known as Taylor’s Refresher) is a classic and a MUST. The ahi poke tacos are to die for. Visit the original in St. Helena or the Oxbow Market outpost in Napa. Stop by La Luna for the best burritos in town and possibly your life. Mustards Grill is a local institution. I literally grew up there and those onion rings just speak to my soul! Cindy Pawlcyn’s other restaurants Cindy’s Backstreet Kitchen and Cindy’s Wood Grill are fantastic as well. Waterfront dining at the charming Angele in downtown Napa is pure magic! Cook in St. Helena is the go-to for locals lunch and dinner. I love their minestrone soup! The Thomas is also fabulous for drinks on the roof or for dinner! Now, make sure you come hang out at the Lorenza Rosé–Free People tent on the Citi Stage at the festival! Its going to be the hottest spot in town! 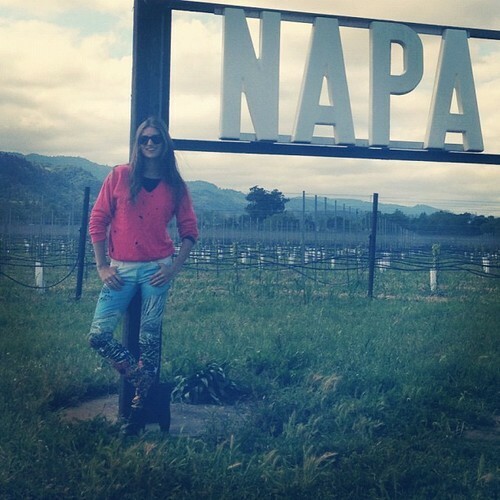 Follow us @lorenzarose @kissser @freepeople @bottlerocknapa on instagram and twitter for live updates. Much love and see you this week! !